In 1906, a boy of 14 ventured from Arna, a village in Sparta, Greece, to America on the English Ship Compania, with one suit of clothes and enough money ($57) to cover fair, food and the immigration law, which stated that any alien must have $25 in his pocket to enter America. He settled with Greek friends in Brooklyn, N.Y., and found a job as a pin boy in the bowling alley of the Germany Club, making “good money” at $1.50 a week. He diligently saved what he could and soon had $15, enough to buy a pushcart. Thus began the humble beginnings of a career in the food business, as the young boy pushed his cart through the streets of Rockaway, N.Y., selling peanuts and popcorn. At the urging of his first cousin, he came to Annapolis to meet Cecelia Mandris, whose beauty and charm captured his heart. In 1913 they wed, and Annapolis became the the new and permanent home of Sam Lewnes. Sam, with his brother-in-law, operated the Palace Confectionary on Main Street. Later Sam and his brother, John, opened the Sugar Bowl on West Street and the Busy Bee Lunch on Calvert Street. In 1921, Sam bought a business in Eastport, (a subdivision of Annapolis) from his brother-in-law Nick Mandris, and opened Sam’s Corner. Sam, with his eldest son George, who married Helen Diamond in 1940, continued the family tradition of serving the public building a small concession stand at Horn Point Beach, selling hot dogs, peanuts, and soft drinks to the bathers. For years, George and Helen also ran a similar concession stand at the East Port Fire Department carnivals. Then, in 1947, George and his brother Lou, took over Sam’s Corner and named it Lewnes’ Bar & Grill. For many years, Lewnes’ was a favorite lunchroom with local residents and the workers at Trumpy’s boatyard. Nine years later, George left Lewnes’ Bar and Grill in the capable hands of his brother Lou, and with his wife and his father, ventured two blocks away and opened the Bridgeview Restaurant, a small establishment which seated 50 people. 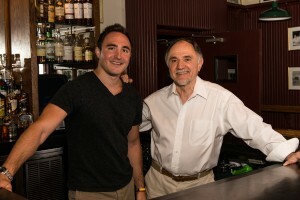 George and Helen’s two sons, Spiro and Charlie, eventually joined their parents in the family business, and by 1966 added a lounge and changed the name to the Yardarm. More renovation followed in 1975 with the expansion of the kitchen and dining facilities to accommodate 250 people. With the addition of Greek Cuisine to the menu, the Lewnes’ family decided to rename their restaurant Spiro’s. With the passing of Sam in 1981, and George in 1983, the family sold the business. With the restaurant business still in his blood, Charlie and his wife Pam, and sons Sam and Mack, ventured back to Fourth Street, and bought the restaurant from their Uncle Louie. In 1989, after extensive remodeling, Sam’s Corner reopened in honor of Sam Lewnes, the man who 83 years earlier had started it all. The demand for prime steaks encouraged Charlie to establish Lewnes’ Steak House.